Until now, numerous iGEM teams have proposed effective projects against harmful and fatal medical conditions. We believe that synthetic biology poses a promising option to invent robust medications and treatments, this year we have targeted the most lethal disease worldwide and utilized SynBio to be used as a safe and efficient weapon against it. We have tackled the medical disparity that is ischemia. Ischemia, “iskhaimos” in Greek, is the fusion of words “iskho”, keep back, restrain, and “haima”, blood gaining the mean of “staunching blood”.Theoretically, ischemia is the restriction of blood supply to the tissues, generally caused by the blockage of blood movement, which causes shortage of oxygen and nutrition vital for cell metabolism and survival. Since oxygen is carried to tissues only via the blood stream, insufficient blood supply causes tissues to become starved of oxygen. In the highly aerobic tissues of the heart and brain, irreversible damage in tissues can occur in as little as 3–4 minutes at body temperature. The kidneys are also damaged at a rapid rate due to the drop in of blood flow. Also, tissues with respectively slower metabolic rates may undergo such irreversible damage after 20 minutes. The process known as ischemic cascade is a definition of how ischemia causes tissue damage. The build-up of metabolic waste products is the main cause of damage that inevitably causes inability to maintain cell membranes, mitochondrial damage, and eventual leakage of auto-lysing proteolytic enzymes into the cells and surrounding tissues. The blockage of bloodstream usually occurs due to a clot; therefore all risk factors that are related to the formation of clot may also contribute to this phenomenon. We can mention that the tendency of clot formation, which is also called thrombophilia, is enchanced dramatically due to excessive body weight. Every year, about 1.5 million Americans have heart attacks resulting in a total of 500,000 deaths. A heart attack occurs every 20 seconds which is equivalent to a death per approximately every minute. (1) Ischemic heart disease is the most common cause of death in most Western countries and a major cause of hospital admissions. In 2011, heart attack was one of the top five most expensive conditions seen during inpatient hospitalizations in the U.S., with an aggregate cost of about $11.5 billion for 612,000 hospital stays. As a result of the high surface tension of the bloodstream, these rigid plaques can damage and rupture the vessel walls. Subsequently, the rupture induces the vessel cells to secrete pro-coagulative factors which initiate the activation of clotting. The impairment of the conveyance of blood supply gradually results in the death of the tissue. This state is broadly described as hypoxia. The scientific description above may not reflect the importance of this topic; yet the reality is different. Ischemia is related to the most serious conditions of today's medical problems. The well-known heart attack, which is responsible for most of the deaths worldwide, is actually an ischemic condition. In addition to this, the loss of a specific region of the brain because of poor blood perfusion is highly associated with ischemia too and is famously known as stroke. 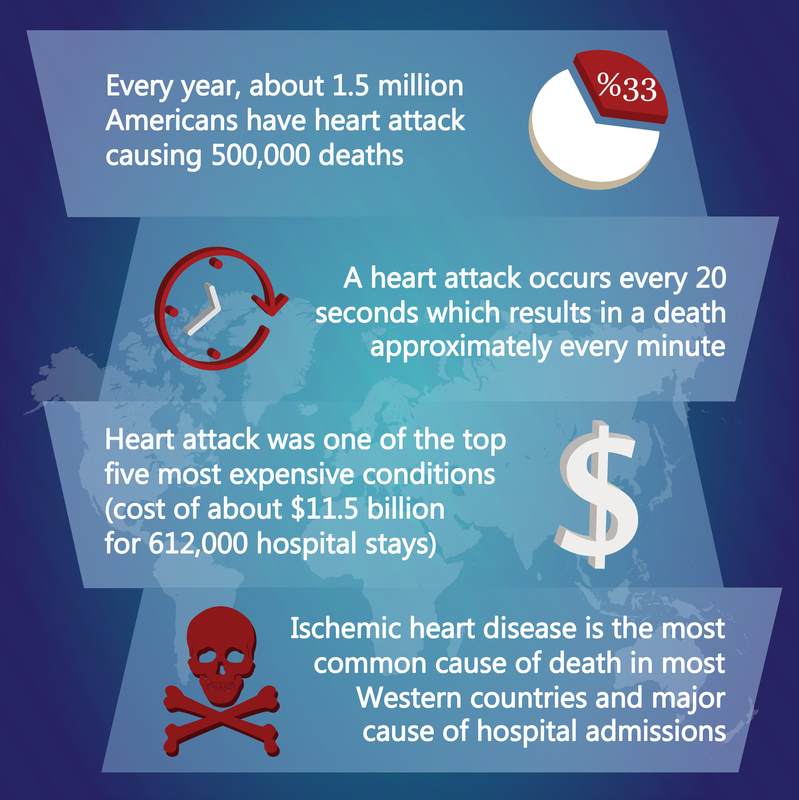 In fact, every year, about 1.5 million Americans have heart attack causing 500,000 deaths. A heart attack occurs every 20 seconds which results in a death approximately every minute. (1) Ischemic heart disease is the most common cause of death in most Western countries and a major cause of hospital admissions. In 2011, heart attack was one of the top five most expensive conditions seen during inpatient hospitalizations in the U.S., with an aggregate cost of about $11.5 billion for 612,000 hospital stays. The phrase "heart attack" is often used non-specifically to refer to myocardial infarction or to sudden cardiac death. An MI is different from, but can cause cardiac arrest, which is the stopping of the heartbeat. It is also distinct from heart failure, in which the pumping action of the heart is impaired. However, an MI may lead to heart failure. 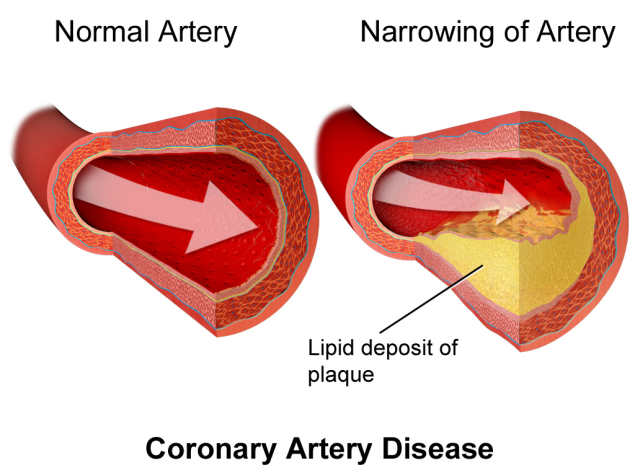 Heart attack is known in medical literature as coronary heart disease, or coronary artery disease, due to atherosclerosis, or the build-up of fatty acid as a plaque on the inner lining of coronary arteries. 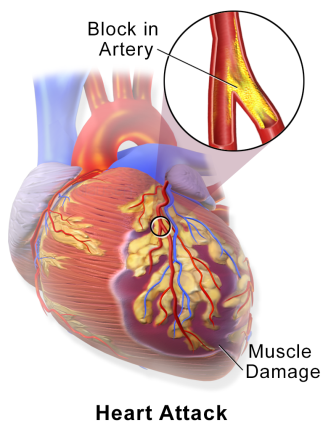 The plaque and resulting blood clots block the artery partially or completely, reducing the amount of blood that can flow through the artery to the heart. This cuts off the oxygen supply to part of the heart muscle. (2) If impaired blood flow to the heart lasts long enough, it triggers a process called the ischemic cascade; the heart cells in the territory of the occluded coronary artery die (chiefly through necrosis) and do not reproduce. A collagen scar forms in their place which also puts the patient at risk for potentially life-threatening arrhythmias, and may result in the formation of a ventricular aneurysm that can rupture with catastrophic consequences. A heart attack requires immediate medical attention. Treatment attempts to save as much viable heart muscle as possible and to prevent further complications, hence following the phrase "time is muscle”. Although the main symptoms of heart attack are well-known and described, some of these attacks can be mild and unrecognized. This results in the weakening and the loss of heart tissue, which may pave the way for more dangerous heart attacks that can end up with mortality. In many cases there are estimates as high as 64%, for individuals that do not have chest pain or other symptoms. These heart attacks that occur without any symptoms or with very mild symptoms are called silent heart attacks(3). At least one-fourth of all heart attacks are silent, without any chest pains or other symptoms. These cases can be discovered later on electrocardiograms, using blood enzyme tests or at autopsy without a prior history of related complaints, however all of these are late for an effective treatment. This latency in the nature of heart attacks obliges us to find a more effective prevention or solution method that can initiate the healing process instantly. The treatment of ischemia includes the removal of the blockage. This, however, is only the beginning of the solution. So far, we are able to dissolve the clot ingredients with specific medications. However, the hypoxic tissue have adapted to such new severe conditions in order to survive by accelerating and multiplying energy providing pathways and oxygen dependent reactants. 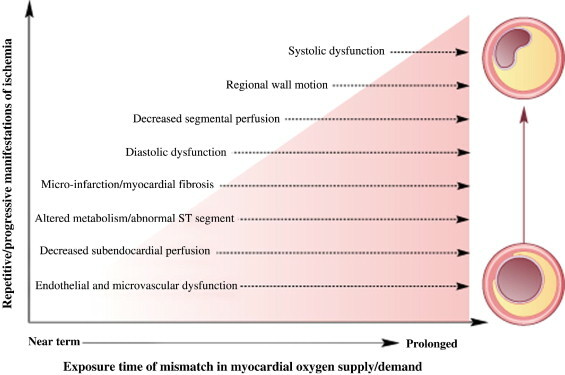 The absence of oxygen and nutrients from the blood during the ischemic period creates a state in which the rejuvenation of circulation to its original state results in inflammation and oxidative damage due to the induction of oxidative stress instead of the restoration of normal function. These oxygen consuming reactions may cause some leakages that produce toxic chemicals called reactive oxygen species (ROS). ROS are intermediate products of oxygenation which have an absence of one electron in their covalent bonds. This makes them ultimately unstable. By means of this, ROS can disrupt almost all cation and anion structures present in cell media. Removing the clot allows fresh blood with high concentration of oxygen to reach the hypoxic tissues. Restoration of blood supply to ischemic tissues can cause additional damage known as reperfusion injury. This can be more damaging than the initial ischemia. (5) Reintroducing blood flow brings oxygen back to tissues, causing a greater production of free radicals and reactive oxygen species, thus damaging cells.Hypoxic cells may use excessive oxygen due to their boosted oxygen consuming systems, which would result in greater production of ROS particles. Further inflammation would attract white blood cells to the perfused site, inducing them to secrete more ROS to the medium as they recognize the inflammation as a threat to the body. The ROS can damage all of cell components including DNA, cell membrane and organelles. In prolonged ischemia (60 minutes or more), hypoxanthine is formed as a product of ATP metabolism. The enzyme xanthine dehydrogenase acts in reverse, functioning like xanthine oxidase due to the abundance of oxygen. This oxidation converts the dissolved oxygen gas to highly reactive superoxide and hydroxyl radicals. Xanthine oxidase also produces uric acid, which may act as both a pro-oxidant and as a scavenger of reactive species such as peroxynitrite. Such radicals and reactive oxygen species attack cell membrane lipids, proteins and cell components, resulting in further damage. 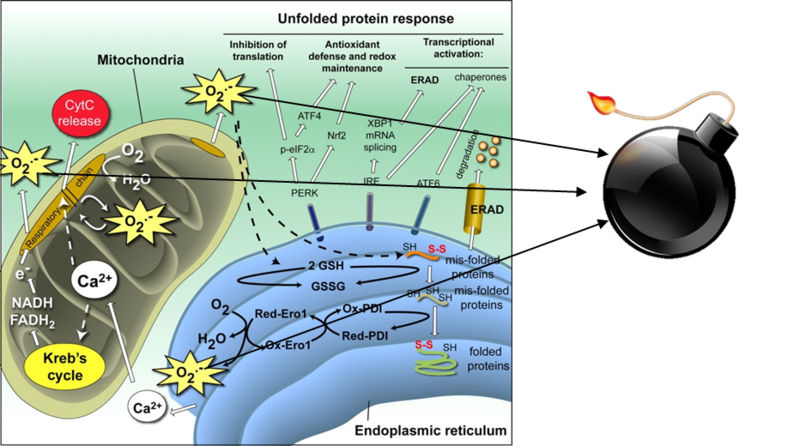 Because of these, an effective and safe treatment of ischemia must both remove hypoxia and also prevent reperfusion injury caused by ROS production and its related pathways such as xanthine degradation.